When it comes to mobile operating systems, apps still reign supreme. 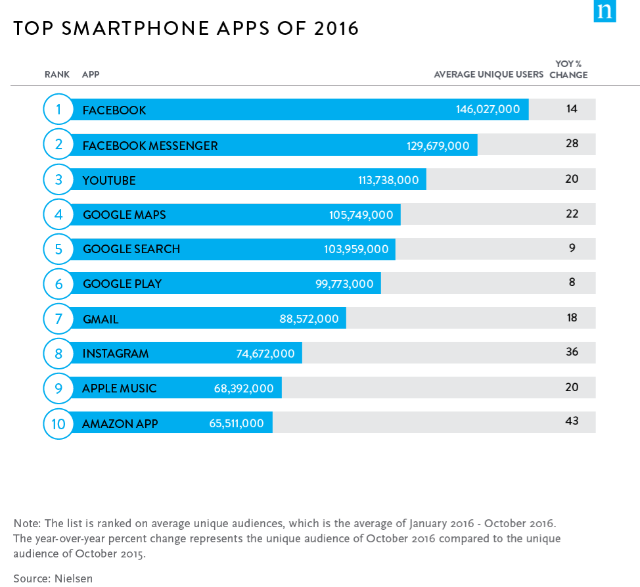 To highlight which ones were most popular in 2016, Nielsen conducted a study of Android and iPhone smartphone users. Not surprisingly, two major players in the mobile space -- Facebook and Google -- lead the pack. "Nielsen's Electronic Mobile Measurement is installed with permission on panelist smartphones (approximately 9,000 panelists ages 18+ with Android and iOS handsets). The panelists are recruited online in English and include Hispanic, African-American, Asian-American, Native American and Alaskan Native and other mixed racial background consumer representation", says Nielsen of its methodology. Facebook holds the first, second, and eighth spots -- remember, the company owns Instagram too. Google has the most number of spots in the top 10, with three, four, five, six, and seven. Rounding out the bottom of the list is Apple and Amazon. Google Play is sort of a weird inclusion, however, as it is the app which downloads other apps -- it probably should have been excluded. Amazon saw insane growth, seeing a massive 43 percent year-over-year gain. Instagram comes in at second place with 36 percent. Facebook Messenger scores the third spot. The biggest surprise is that Apple Music is the top streaming music app, beating apps like Pandora and Spotify. As a user of Apple's music service, I know it is the best, but I am still surprised because other music apps had huge head-starts. 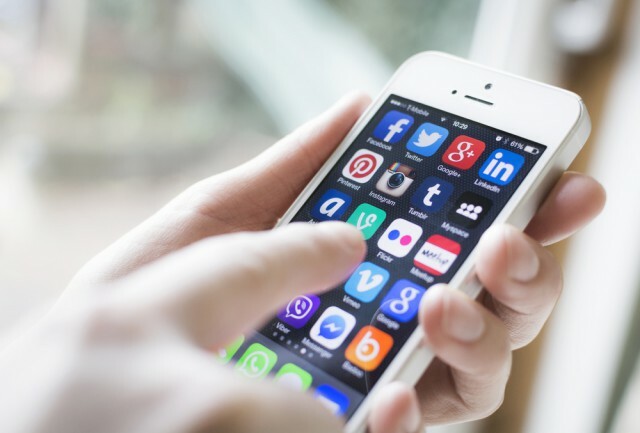 Are you surprised by any apps on the top 10 list? Tell me in the comments.